Q235B and Q345B are two structural steel grades widely used in China. In previous studies, more precisely in 2012, Nie defined a normalized constitutive model using material damage accumulation to describe damage behavior of Q235B steel in circular tubes. 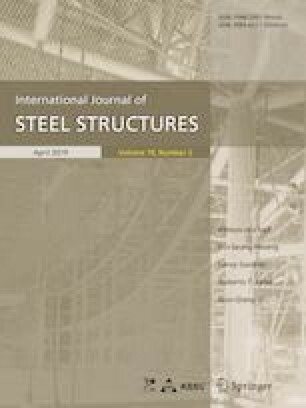 This paper focuses on the hysteretic damage behavior of Q345B steel in a circular steel tube under cyclic loads and describes the damage mechanism through a damage constitutive model based on experimental results. Three equations are implemented in the constitutive model, which includes a damage index to accurately describe the plastic and damage behavior of the material. Experiments were conducted in which a cyclic loading is applied in three directions on a circular steel tube. The constitutive model was implemented in the ABAQUS FEA software through a user-defined subroutine. Some parameters in the constitutive model were calibrated based on the experimental and numerical results. The performance behavior of a single-layer reticulated dome under seismic motion record was investigated through the increment dynamic analysis method. The results indicate that the constitutive model is suitable for analyses and quantifying seismic damage accumulation and progressive failure and it is also beneficial for investigating the nonlinear dynamic behavior of structures under seismic loads. The effect of accumulated material damage can describe large-scale structural deformation and obvious reduction in the failure limit load. This study is jointly sponsored by China Earthquake Administration Fundamental Research Program (2018B12), National Natural Science Foundation of Heilongjiang Province, China (E2016071) and Program for Innovative Research Team in China Earthquake Administration.